I live by myself. I don’t think we’ve talked about this yet, but it’s a fact that makes itself apparent all the time these days. For example, I am reminded that I live alone when I find myself singing country music at unreasonable volumes, watching Sense and Sensibility two times in a row, flinging my clothes off in the middle of the room before a shower, and eating ice cream straight from the carton (ahem. Not that I do that.) I daresay most of these activities are unsuitable when there are roommates to consider (though, I confess, I often ate ice cream straight from the carton while living with Kath in Boston. She was the best kind of roommate, in that the violation of ice cream cartons didn’t seem to bother her. Thanks, Kath.) At any rate, these days I find myself in the position of being able to engage in all of these anti-roommate activities, and I must say that I quite enjoy it. I mean, who wouldn’t want to watch back-to-back showings of Sense and Sensibility? There is one problem, though. Though I can take my clothes off without abandon and listen to whatever music I want at whatever volume I prefer, I cannot by myself eat two full cartons of fresh strawberries from the Union Square Green Market before they go bad. I have tried, and it just can’t be done. 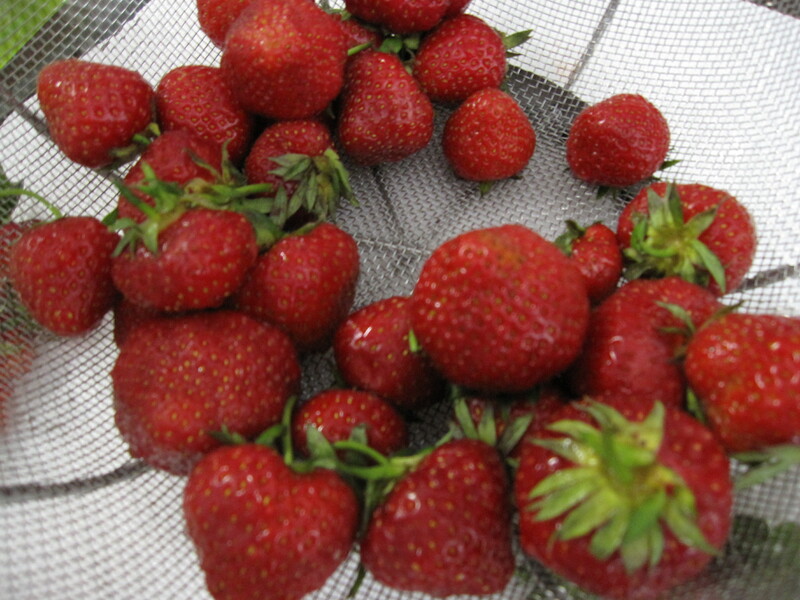 At any rate, many strawberries were consumed on Thursday, and that was only the beginning. After JBursk and I spent Thursday popping strawberries straight from the carton, there was still a sizeable mound of the red berries left on my counter. Emily, Casey and I decided to take care of that problem with something called strawberry rhubarb crumble. Thank goodness. I mean, I was thisclose to having to throw out a carton of moldy strawberries! …Whew. Living alone is nice, but that was a close call. Thank goodness for weekend sister visits, and thank goodness for strawberry rhubarb crumble. Crumble. The name alone is rustic and sweet. It says “I’m unfussy yet delicious. I’m sweet from my strawberries and tangy from my rhubarb. I’m warm and comforting yet light enough for summer nights, and I’m phenominally easy to make.” Speaking of, this weekend is apparently the last weekend for strawberries and rhubarb at the Union Square Green Market, so you only have a few days left to solve your own excess strawberry crisis with a delicious crumble. Godspeed. Preheat oven to 350 degrees. 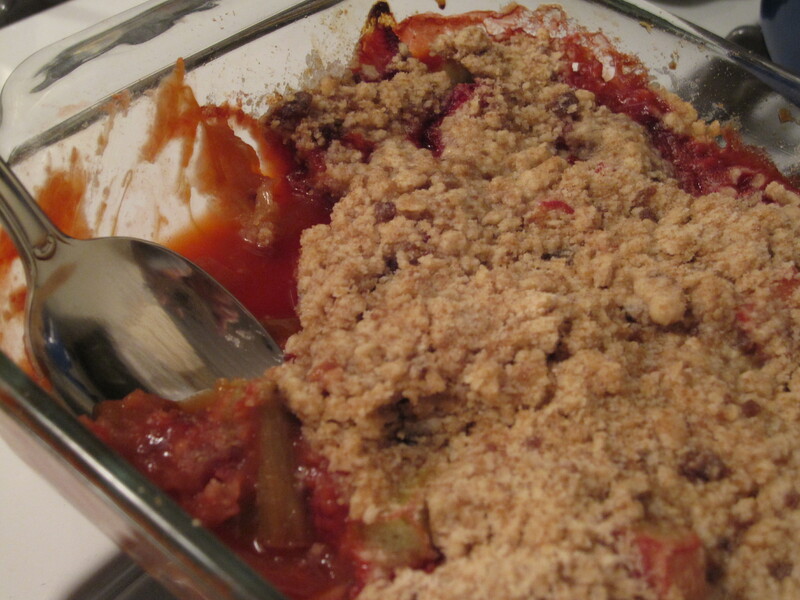 Mix the strawberries, rhubarb and sugar in a medium baking dish (roughly 8 x 12). Squeeze lemon juice over fruit, and mix to combine. In a medium bowl, mix together the flour, sugar and salt. Use two forks or a pastry cutter to mix in 6 tablespoons of butter, until the clumps of butter are as small as peas in the batter. Pour the crumble mixture over the fruit in the baking dish, and use your fingers to crumble the remaining 2 tablespoons of butter over the entire dish. Bake for about 40 minutes, until the fruit is warm and bubbly and the crumble is golden brown. Serve immediately, preferably with a large scoop of vanilla ice cream. Good resourceful thinking on the strawberry crumble! Living alone, you can even eat this right out of the serving dish. Not that I uh, know anything about doing that kind of thing!